First, ever built mass-produced pickup truck from German auto manufacturer Mercedes was released last year. This dual-cab ute is carrying a label 2018 Mercedes-Benz X-Class. Technically speaking, it is not quite a German product since it will be developed by Nissan Motor Iberica. Also, the platform and many body panels will be borrowed from Nissan Navara model. However, since the debut of the concept model, the well-known German technology and design were noticeable. Now, the biggest question is, after sedan and SUV models, could we expect AMG version of the pickup truck too? This question was addressed to the CEO of the Mercedes-Benz Vans, Volker Mornhinweg at the official presentation of the X-Class in Australia. He was quite exclusive about the possibility of V8 powertrain under the bonnet of the new truck. However, when it comes to AMG styling, apparently the company hasn’t decided yet. 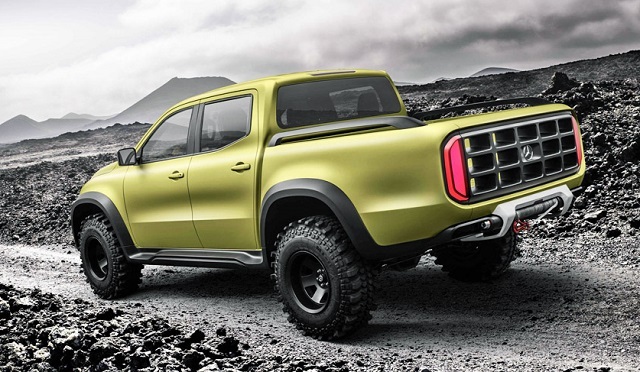 It is not realistic to expect this version of the truck soon, but if the market shows demands for it, Mercedes-Benz X-Class AMG will be introduced. For now, the new X-Class will be offered in three trim levels. The entry-trim will be Pure, mid-range Progressive and the top-end Power. Looking all these trims it is noticeable some space for the AMG package. 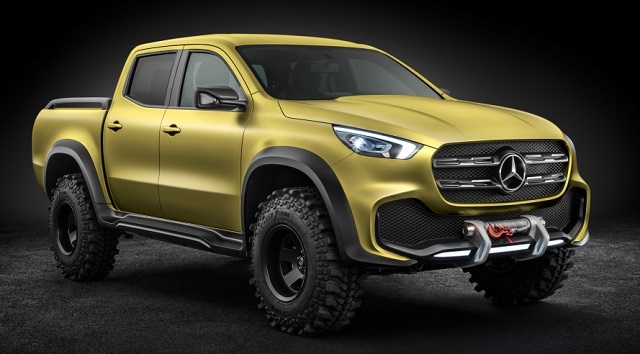 The Mercedes-Benz X-Class AMG will not be as aggressive as some coupe or sedan models, but the front-end have space to receive some daredevil appearance. This could be achieved with the new black bumper and a grille with honeycomb mesh and AMG badge in the middle. The rear side should stay unchanged with the exception of the rear bumper which should be matte black. Both, head- and back-lights should get darker. The side chrome details should also be replaced with dark parts which should be mated to the new black carbon-fiber mirror caps. The X-Class AMG model should be lower than the regular truck which will additionally contribute to the sportier look. Inside, the AMG version of the truck should not be overcrowded with gadgets and unnecessary features. The dashboard should be slightly upgraded with AMG lettering, sportier dials, and some carbon-fiber inserts. The 8.4-inch infotainment system is already offered with the regular model and it can be kept with the AMG version too. The seats should be perforated Nappa leather and designed for a sportier ride. Steering wheel should be packed with all necessary commands and also covered with leather. The 2018 Mercedes-Benz X-Class comes with three engine options. The only petrol mill will be a turbo four-cylinder that delivers 164 horsepower. The diesel options will be much more respectable. The first one is inherited from Nissan and it will be 2.3-liter turbodiesel with 188 horsepower and 332 pound-feet. The second one is 3.0-liter V-6 turbo diesel produced by Mercedes. This engine can deliver 255 horsepower and 406 pound-feet of torque. Since the 4.0-liter V8 will not be an option under the hood of the new truck, if Mercedes decides to put the AMG version into production the 3.0-liter V-6 should be upgraded like with the GLC43 crossover. This, improved version produces 362 horsepower and 384 pound-feet of torque. The transmission will be automatic, for sure, and it will deliver power on all four wheels. If Mercedes keeps its promise and give up from the V8 engine under the hood of the new truck the AMG version should be around $15,000 more expensive than the regular model. Taking in mind that the base model costs $43,000, the price of the Mercedes-Benz X-Class AMG could cost between $55,000 and $60,000.